All vehicles that are designed to move slowly (less than 25 mph) shall be equipped with a SLOW MOVING VEHICLE emblem if expected to operate upon roadways day or night. These vehicles include owned, rented or leased tractors, motorgraders, loaders, backhoes and any other equipment that may operate on the roadways. 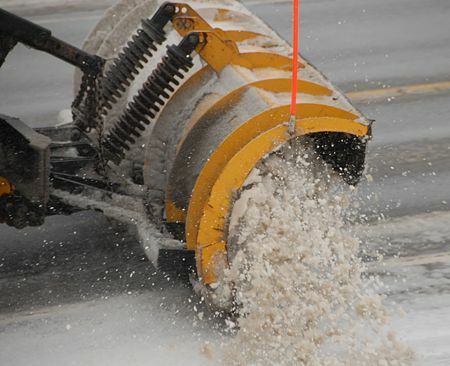 Slow moving emblems should not be installed on salt spreaders, dump trucks and other licensed vehicles that normally operate at traffic speeds. These vehicles should use warning lights, flashing arrow panels or other warning devices when operating at slow speeds. Reasons for policy: RSMo 307.127 State Laws Vehicle Equipment Regulations and the safety of motorists and employees. Each end of front snowplows should be delineated with a vertical rod, cable or other type of similar material. The delineator may include a red flag, red reflector to the rear with white reflector to the front, amber reflectors, fluorescent orange tubing, red conspicuity tape or other similar systems to mark the plow ends for operator and public recognition. Only red sections of conspicuity tape may be used on the backside of snowplows for additional identification. Reasons for policy: Safety of travelers, the safe operation by MoDOT employees and the delineation of the over width plow. Amber warning lights shall be installed on maintenance motorized equipment to warn the public and to enhance safety of MoDOT workers. Warning lights may be of various types including flashing, revolving, strobe, light emitting diode or other systems to warn traffic. In general, all vehicle warning light systems should be able to be seen 360° or adequately warn approaching traffic. Warning lights shall be visible from at least 500 ft. Use of warning light systems shall be in accordance with Missouri Revised Statutes Chapter 304 Traffic Regulations. All snow and ice removal equipment should be thoroughly cleaned, greased and lubricated following each snowstorm and readied for the next storm when temperature conditions allow. At the end of each winter season, all snow and ice removal equipment shall be thoroughly cleaned, inspected for repairs, repaired as necessary, marked for replacement as necessary and preventive maintenance performed on the equipment to prevent rusting. The equipment shall then be properly stored. Reasons for policy: Protects longevity of equipment and ensures proper equipment operation. Equipment used to apply both liquid and dry snow and ice control materials shall be calibrated before the start of the winter season and re-calibrated or verified at regular intervals during the winter season. Reasons for policy: Efficient snow and ice removal at minimum cost. Rented equipment shall have substantially the same as or better lighting than MoDOT equipment, unless protected by another vehicle with the proper warning light system. Reason for policy: Safety of MoDOT employees and traveling public. This page was last modified on 8 April 2016, at 14:28.